Amy Schumer says she wanted to be open about her husband's high-functioning autism spectrum disorder to help eradicate any stigma. 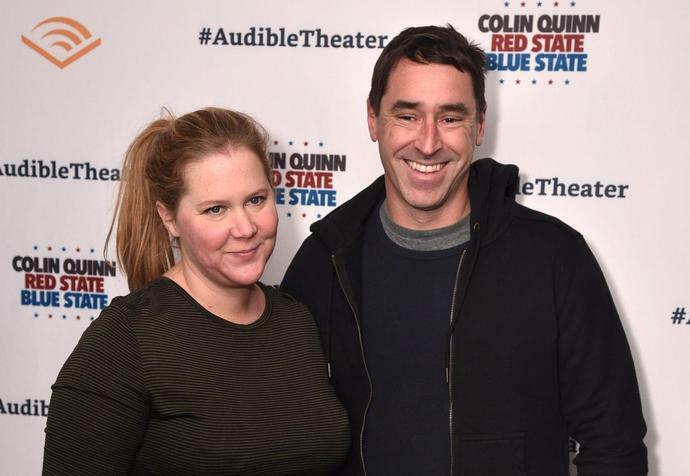 Chris Fischer, a chef who Schumer wed last February, is a topic of her second Netflix comedy special "Growing," which dropped Tuesday. The comic soon received praise from autism advocacy groups for bringing visibility to people with ASD, a "developmental disorder that affects communication and behavior," including, "difficulty with communication and interaction with other people" and "restricted interests and repetitive behaviors," according to the National Institute of Mental Health. As a guest on "Late Night" Wednesday, Schumer agreed with Seth Meyers that her husband's diagnosis was "a sum positive" for their union. "Yeah, totally. That's why we both wanted to talk about it, because it's been totally positive," she shared. "And I think a lot of people resist getting diagnosed, and even with some of their children, 'cause of the stigma, that comes along with it. "But you're not just diagnosed, and then they throw you out," she continued. "Hopefully, if you can get help - like the tools that we've been given, have made his life so much better and our marriage and our life more manageable. And so I just wanted to encourage people to not be afraid of that stigma." The "I Feel Pretty" star acknowledged her husband's life is "not like everybody on the spectrum" and complimented him as "an amazing guy." "I don't want to make it sound like, 'I'm so nice that I married someone with autism,' " she said. "I fell in love with him, and I wouldn't trade him in for anybody." As she does in her special, Schumer also talked about the fact Fischer can't lie. "It's a dream, but it's also like a real nightmare," she said Wednesday. "He's here, and I came out, right before 'cause I changed outfits. I'm like, 'Does this look OK?' And he was like, 'Well, it's too late.' He's right though. It was too late!" In "Growing," Schumer speaks of her husband's condition with love and humor, saying that dating him presented many " 'Huh?' moments." For example, instead of helping her up once when she fell, he "kind of froze and became a lighthouse, opening and closing his mouth." She also tells a story about how, before their first red-carpet appearance, Schumer encouraged Fischer to think of the ocean as cameras flash, because "one of the signs of autism is you don't make the appropriate facial expressions for the occasion you're at." That's because, of all the winners that 5G stocks will create, Intel believes it's already lost out in the mobile 5G space, which our own Matt McCall predicts to be a mega-opportunity that comes along once in a lifetime: "Only one company can be first. But in the coming years there will be a slew of big winners as 5G becomes mainstream," Matt wrote recently on InvestorPlace.com. Let's take a trip down memory lane to better understand the opportunity we have with 5G stocks … Long before Netflix (NASDAQ:NFLX), there was Blockbuster.